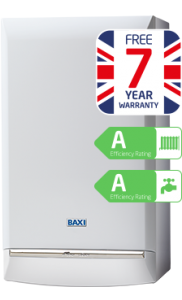 The Baxi Duo-tec ERP is Baxi’s latest combi boiler. It is very reliable, it is a Energy Saving Trust recommended product and it comes with a free 7 year warranty. “The Baxi Duo-tec Combi boiler is a firm favourite with installers and householders because it is straightforward to install and simple to use. It is an Energy Saving Trust endorsed product, so you can be sure it meets the highest standards of energy efficiency.